In this installment of the Meet Spoonflower series, I’d like to introduce you to Allison Tate. 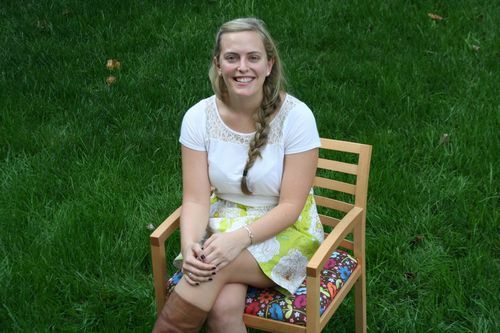 Allie first joined us back in the summer of 2009 as an intern and then part-time employee. She left for awhile to finish up her degree at NC State University but has re-joined us now as a full-time employee. 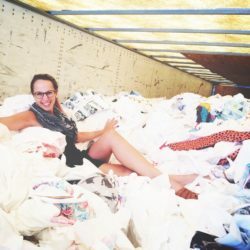 Read on for her perspective on the early days at Spoonflower and how things have changed! You started officially at Spoonflower a few months ago but I know you really got your start as an intern with us back in our early days in 2009, when the office was still in Mebane. How did you first hear about Spoonflower and what made you want to be an intern here? I started as an intern in June of 2009, worked through August, then came back that fall as a part-time weekender through January 2010. I first found out about Spoonflower through my Dad who had read an article on the NC Idea Grant. I thought it seemed like an awesome and exciting company, especially since I was pursuing a textile degree. We really are glad you’re back, Allie! What do you think about the new space? The new space is wonderful, especially the ability to climate-control! I am happy not to have sweated all summer and expect I won’t be warming my hands by the heaters this winter. I also love all the special decorating touches put up by Spoonflower employees. It’s really added to the character of the building and makes it feel like Spoonflower home. You’re a recent graduate at N.C. State University. What did you get your degree in? What were your favorite textile-related classes while you were there? My degree is a BS in textile marketing and brand management. My favorite class was Computer Aided Design which I took the semester after my internship with Spoonflower. One of our major projects was actually designing fabric for digital printing using the same printers we used at Spoonflower! Surprisingly, I also loved the more technical courses in textile technology and polymer and color chemistry. It was very interesting learning the science behind textile formation and the chemistry behind dyeing and printing techniques. How have things changed at Spoonflower since the time that you were interning and now? Things at Spoonflower are a lot more fancy since my interning days. From the air-conditioned building to the iPads to the full-sized fridge, we’ve really moved up in the world! The process of handling orders has also become more concrete and logical, which makes processing orders much more smooth and efficient. What sorts of creative things do you like to do in your spare time? In my spare time I like to get creative in a number of ways, covering things in glitter being a favorite. I love sparkly things! I also do a little sewing and have so far made lots of un-wearable things. But I did recently make my first wearable skirt! I enjoy various crafty things and love trying new techniques, but I have the habit of starting projects and never really finishing any of them. I love Holli Zollinger’s designs, like most of us in the office. I love the way she balances simplicity with fun interesting touches. Of her designs, I’d have to say the elephants with umbrellas is my favorite. I think they’re just perfect! What’s the most surprising thing you’ve ever seen come off the printers? Wow, that’s a tough one considering all the exciting designs we receive. In general, I’m often surprised by how creative our customers are. I see designs daily that surprise and inspire me. It’s unbelievable the range of beautiful designs we print! What’s your favorite Spoonflower base fabric? Currently, I’m loving our new cotton silk because colors print so beautifully on it. But I’ve always been a fan of our organic cotton sateen since it’s a nice weight for various projects. If I could only be as talented a sewer as other employees at Spoonflower, my wardrobe would be much cuter. Without my wonderful family I wouldn’t be a Spoonflower employee at all. My mom has always encouraged creativity and supported my ever-changing creative outlets. My dad introduced Spoonflower to me and went with me to tour the Mebane offices, which opened my eyes to the exciting world of digital textile printing. My lovely sisters provide inspiration and support and are recipients of lots of handmade gifts, some of which probably aren’t the best constructed! And lastly, I give credit to my grandmother, whom I believe to be Spoonflower’s biggest fan. She shares my love of fabrics and is always amazed by the beautiful works of art we produce. I’m working on a fabric stash to rival hers! Hey awesome skirt- love it!! :)) And glitter too- woot! So nice to meet you Allie! 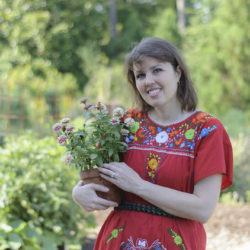 Thanks for a great bit of you, and thanks to spoonflower for the great interview! I look forward to the next ‘interview’ — this is really cool. 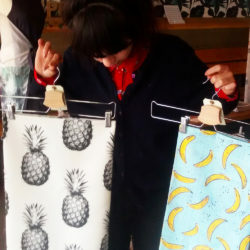 Thus far it looks as though Spoonflower has a very young workforce.